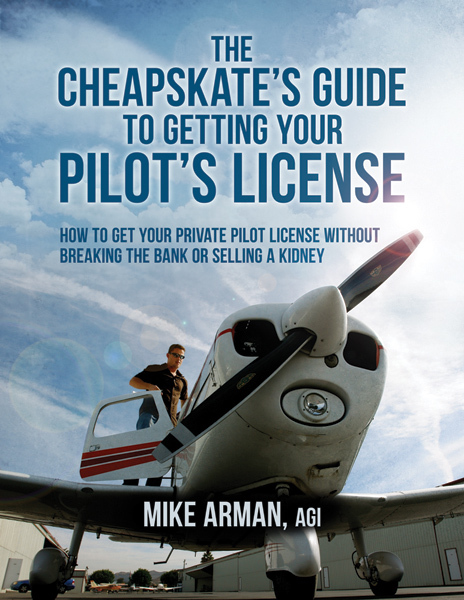 How to get your FAA pilot's license without breaking the bank or selling a kidney. Do NOT pay retail, this book will save you thousands! Here's how you can earn a 100% valid FAA pilot's license - the real thing - for less than half of the retail rate. No compromises, no gimmicks, no excuses, no gotchas. Mike Arman has been a pilot since 1978, an aircraft owner since 1982, and as an FAA certified Advanced Ground School Instructor has taught ground school for over a decade. He KNOWS where you need to spend the money and where you will be wasting it, and he shows you how to make every one of your hard-earned dollars work for you, not for someone else. If you have ever wanted a pilot's license but have cringed at the cost, this is the cure. This book can save you 100 times what you paid for it! This book covers: Buying block time and how much to buy (or not), selecting a flight instructor, student pilot bugbears, dry or wet rentals, avoiding $hiny airplane $yndrome, training schedules, getting your medical, when you'll solo, what you'll fly, steam gauges versus glass panels, what costs you can reduce and what you really should pay for, high wing versus low wing, air sense, check-itis, dealing with the FAA, and much, much more. This should be the VERY first book you read if you are interested in learning to fly, and if you are a pilot, makes a wonderful gift for anyone you are trying to seduce into aviation. There is a risk that you could save thousands and thousands of dollars in getting your pilot's license if you buy and read this book. There is a risk that you may find getting your pilot's license the most exciting, challenging, rewarding and satisfying thing you have ever done in your life. There is a risk that since, according to Boeing, something like 460,000 additional airline pilots will be needed in the next twenty years, you might be one of them. My guarantee is simple: Your money back if you are not satisfied.